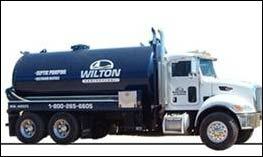 Wilton Sanitation - Septic Pumping and Septic Tank Maintenance, Owen Sound and Collingwood areaWilton Sanitation Inc. Regular septic tank maintenance is important and will help to avoid costly repairs. The Ministry of the Environment recommends septic pumping every 2-3 years for a family of four. Use our Septic Tank Pumping Chart to find out how often you should have your septic tank pumped. A typical septic system has four main components: a pipe from the home, a septic tank, a drainfield, and the soil. Microbes in the soil digest or remove most contaminants from wastewater before it eventually reaches groundwater. The septic tank is a buried, watertight container typically made of concrete, fiberglass, or polyethylene. It holds the wastewater long enough to allow solids to settle out (forming sludge) and oil and grease to float to the surface (as scum). It also allows partial decomposition of the solid materials. Compartments and a T-shaped outlet in the septic tank prevent the sludge and scum from leaving the tank and traveling into the drainfield area. Screens are also recommended to keep solids from entering the drainfield. The wastewater exits the septic tank and is discharged into the drainfield for further treatment by the soil. Microorganisms in the soil provide final treatment by removing harmful bacteria, viruses, and nutrients. You should have your septic system inspected at least every 3 years by a professional and your tank pumped as necessary (generally every 2 to 3 years). A key reason to maintain your septic system is to save money! Failing septic systems are expensive to repair or replace, and poor maintenance is often the culprit. Having your septic system inspected (at least every 3 years) is a bargain when you consider the cost of replacing the entire system. Your system will need pumping every 2 to 3 years, depending on how many people live in the house and the size of the system. An unusable septic system or one in disrepair will lower your property’s value and could pose a legal liability. The information and diagrams in this section are from the EPA United States Environmental Protection Agency brochure "A Homeowner's Guide to Septic Systems"
Visit our FAQ section for more information about keeping your septic system running efficiently.